The David Bellamy Conservation Award Scheme is one of the longest running green tourism awards in the UK starting in 1996. The idea of the scheme was first sown when David Bellamy gave a talk to members of the camping, caravanning and holiday home park industry in which he gave the audience members a challenge to be part of the environmental solution and not part of the problem. David was then invited to visit many parks and was amazed at the wide range of work that the most forward-thinking owners were doing for the environment. David was so impressed that a partnership was formed between the Conservation Foundation and the British Holiday & Home Parks Association to set up an award scheme. The Award Scheme is constantly growing and changing to incorporate the new threats the environment faces. In 2016 it teamed up with the British Beekeepers Association (BBKA) to run the Honey Bee Friendly Park Project, which aims to get as many parks as possible working to conserve Britain’s bees. In 2017 they started the 5in5 initiative, 5 habitats in 5 years, each year is focused on building and maintaining a different habitat – Wildflower, Hedgerows, Wetland, Woodland & Creature Comforts. Since we took over the park in 2000 we have worked with the environment in mind. Our 3 “field areas” on site we leave completely natural to encourage wildflower growth, making them a beautiful area to watch butterflies and bees go about their business. We hold an annual Gardens in Bloom competition on site, using a set criteria that cover the environmental basics like bee & butterfly friendly plants, use of water butts, bird-feeders etc and of course the more colourful and prettier the better! We encourage all children on site to get involved in the annual Butterfly Count and we give information on how to build habitats in your garden. Although we are already doing everything we need to sustain our Gold status we are still continuously working to improve and educate. In 2015 we became a Friends of the Honey Bee supporter and later that year got our very own bee hives placed on site and sell Three Ponds Honey in the office. In 2019 we plan to convert one of our old units into a Wildlife Information Centre, encouraging old and young alike to take an interest in the world around us and to do what they can to help. 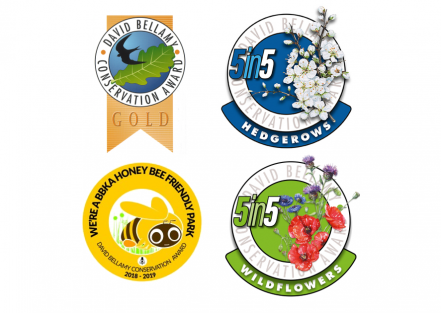 Because we have had this mentality from start we have been fortunate enough to be award the David Bellamy Conservation Award Gold since 2008, we are offically a Bee friendly park, we were awarded our Hedgerows Habitat Badge and this year we got out Wildflowers Badge. We look forward to continuing our environmental work and any future projects that may hold.